The Oakridge School Early Childhood Center provides a developmentally-appropriate program for young children. Our curriculum incorporates mathematics, language arts, science, social studies, perceptual-motor activities, music, Spanish, art, and physical education. Students have computer time in the classroom. Pre-kindergarten and kindergarten classes visit our library once a week to hear a story and check out books, while preschool students have library story time once a month. The program provides opportunities for nurturing self-esteem and building independence. The Oakridge School Early Childhood Center is a place where learning becomes a great adventure that leads to a successful educational future. 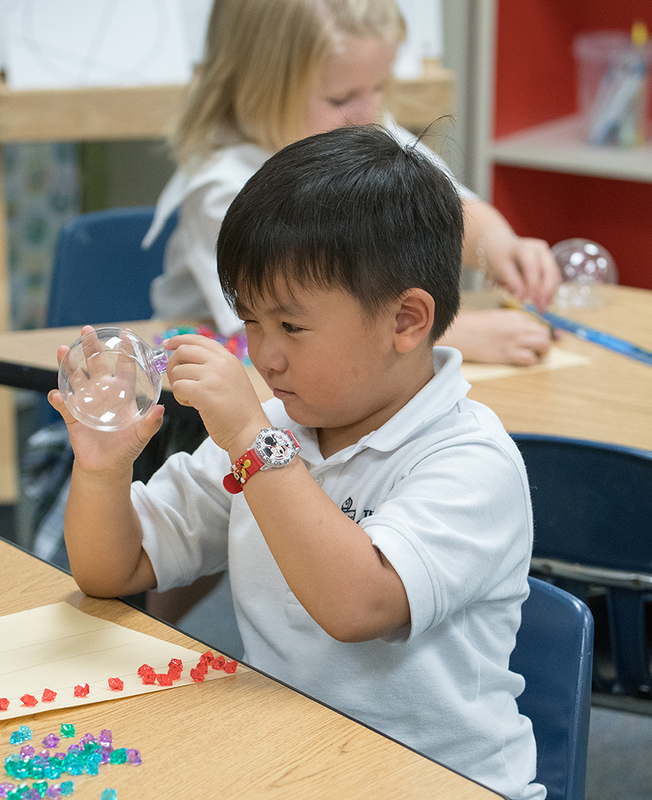 Preschool classes meet three days (Monday, Wednesday, Friday) or five days each week from 8:15 AM to 2:30 PM. Pre-kindergarten and kindergarten classes meet five days a week. The pre-kindergarten day begins at 8:15 AM and ends at 2:30 PM. Kindergarteners begin their day at 8:15 AM and end at 2:45 PM. There are 12 children in the preschool classes and 14 in pre-kindergarten and kindergarten. Kindergarten and pre-kindergarten children wear uniforms. We encourage preschool children to wear comfortable playclothes. Our educational philosophy is traditional. Concepts are introduced to children that are appropriate for their developmental age and life experience. Teachers use the art of discovery and engage students in experiential learning. We believe that children have a right to be children! If children leave the Early Childhood Center loving to learn and feeling good about themselves and their accomplishments, then we feel we've done our job.